A historical investigation into the mysterious bug that wiped out the vineyards of France and Europe in the 1860s - and how one young botanist eventually `saved wine for the world'. A historical investigation into the mysterious bug that wiped out the vineyards of France and Europe in the 1860s - and how one young botanist eventually `saved wine for the world'. In the early 1860s, vines in the lower Rhone valley, and then around Bordeaux, inexplicably began to wither and die. Panic seized France, and Jules-Emile Planchon, a botanist from Montpellier, was sent to investigate. Magnifying glass in hand, he discovered the roots of a dying vine covered in microscopic yellow insects. The tiny aphid would be named Phylloxera vastatrix - 'the dry leaf devastator'. Where it had come from was utterly mysterious, but it advanced with the speed of an invading army. As the noblest vineyards of France came under biological siege, the world's greatest wine industry tottered on the brink of ruin. The grand owners fought the aphid with expensive insecticide, while peasant vignerons simply abandoned their ruined plots in despair. Within a few years the plague had spread across Europe, from Portugal to the Crimea. Planchon, aided by the American entomologist Charles Riley, discovered that the parasite had accidentally been imported from America. He believed that only the introduction of American vines, which appeared to have developed a resistance to the aphid, could save France's vineyards. His opponents maintained that this would merely assist the spread of the disease. Meanwhile, encouraged by the French government's offer of a prize of 300,000 gold francs for a remedy, increasingly bizarre suggestions flooded in, and many wine-growing regions came close to revolution as whole local economies were obliterated. Eventually Planchon and his supporters won the day, and phylloxera-resistant American vines were grafted onto European root-stock. Despite some setbacks - the first fruits of transplanted American vines were universally pronounced undrinkable - by 1914 all vines cultivated in France were hybrid Americans. 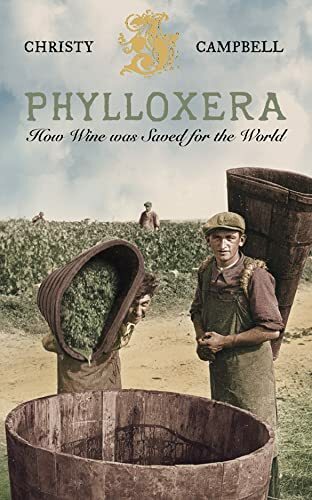 Phylloxera is an entertaining, revealing and frequently astonishing account of one of the earliest and most successful applications of science to an ecological disaster.